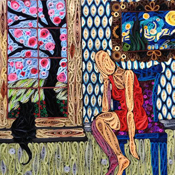 Every now and then I stumble over a project on Craftster that is so intricate, so beautiful, and so detailed that I know for a fact it took forever to complete. Hats off to these Craftsters who had not only the vision, but enough time and patience to create these amazing labors of love. 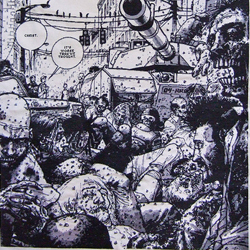 Cross stitch ninja‘s black and white cross stitch version of the Walking Dead comes from an image in the first album of the comic. It’s nothing short of amazing, measuring in at over 70 by 100 cm (that’s about 27.5 by 39 inches)! 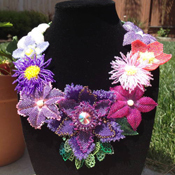 Look at all the beading on this floral necklace. CraftyMamaBee reports that each flower took approximately an hour and a half to complete. It’s hard for me to believe she can work that quickly! Gorgeous. Wowza! 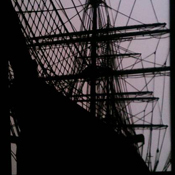 Talk about steady hands and lots of skill: VibrantShadows went through 30 Exacto blades in the making of this intricate Scherenschnitte paper cutting of a giant ship. It’s incredible how she was able to maintain the delicate lines and details. sloth003 came up with a beautiful way to use up some of her fabric scraps. 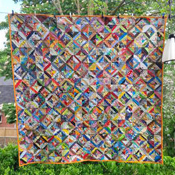 This large quilt is made up of 400 4inch string blocks. I cannot imagine the time it took to cut all that fabric down to size and then create those blocks, but I’m sure you agree with me that it was definitely worth the effort. This beautiful paper quilling work by littlecircles took 85 hours to complete. There are so many details, like the flowering tree outside the window, and the “painting” on the wall. Each of the above Craftsters put so much time, energy, and love into their projects, and it definitely shows. Have you ever worked on a labor of love like this?